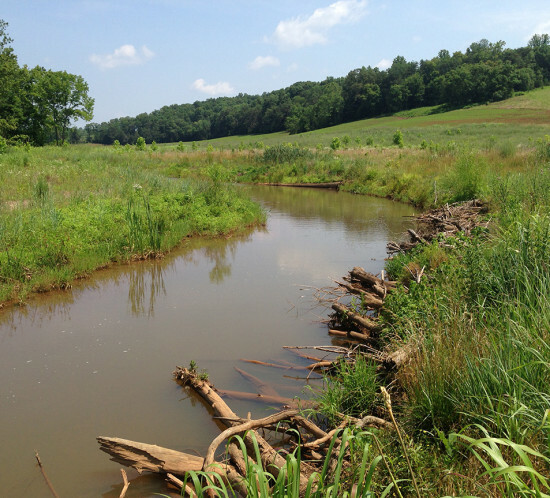 Restore and enhance 63.6 acres of riparian buffer to develop approximately 1.6 million square feet of riparian buffer credit and 58,530 nutrient offset credits. The project includes development of an umbrella mitigation banking instrument, existing conditions assessment, landowner coordination, conservation easement acquisition, stream, wetland, and riparian buffer restoration design, permitting, construction, and seven years of post-construction monitoring. The conservation easement on the project will serve to protect 371.2 acres of land. The Falling Creek Mitigation Bank will encompass over 340 acres along Falling Creek and several of its tributaries. We estimate that it will provide approximately 20,400 stream mitigation credits, 67 wetland mitigation credits, and 39 buffer mitigation credits. Starting in the Fall of 2017, stream, wetland, and buffer credits will be available for sale throughout the Neuse 01 HUC while nutrient offset credits will be restricted to the portion of Neuse 01 below the Falls Lake watershed. 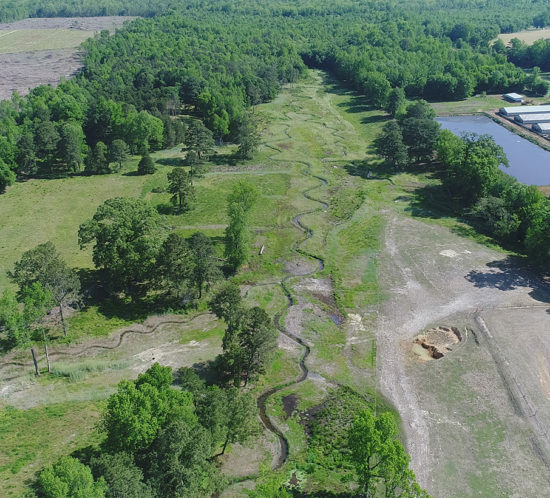 The project involves restoring a large stream and wetland complex draining to Falling Creek and preserving 260 acres of bottomland wetland within the Falling Creek floodplain. The property will remain a working farm however cattle will be fenced out of the easement. The project is anticipated to aid in the removal of Falling Creek from the state’s 303(d) list of impaired water bodies. We anticipate closing on project easements in the Fall of 2016 and constructing the project in summer and fall of 2017. Wildlands completed the construction phase of the Lone Oak Stream Mitigation Bank near Charlottesville, VA, in early 2011. 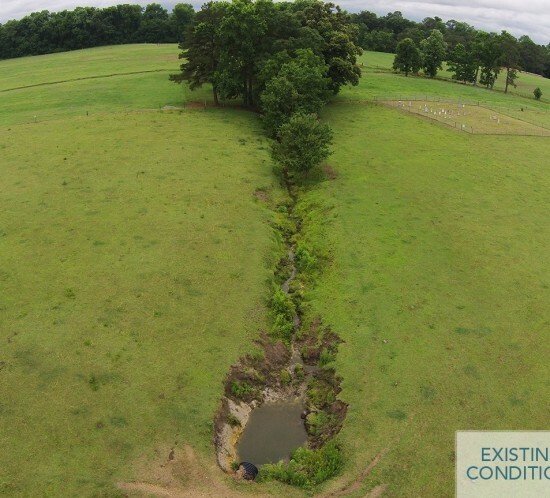 The Lone Oak Mitigation Bank resulted in the restoration and enhancement of approximately 30,150 linear feet of Ballinger Creek and several tributary streams. This project delivered 40,462 stream credits. Restoration of the site and removal of the existing cattle operation is expected to aid in the removal of Ballinger Creek from the state 303(d) list. Key elements of the project consisted of developing the Banking Instrument, permit submittals, and the final design plans and technical specifications; providing construction observation and as-built surveys; and preparing the baseline monitoring report. 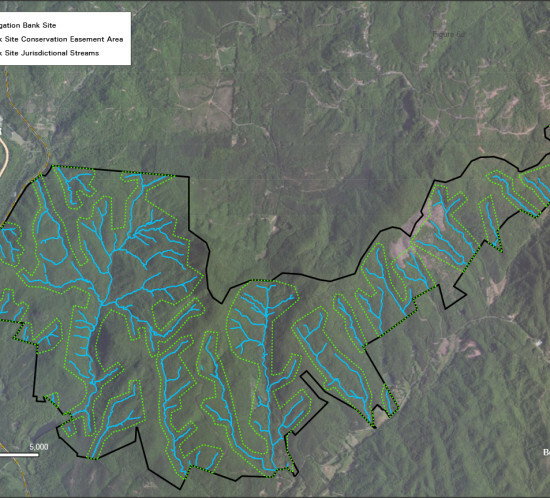 The proposed Box Creek Wilderness Area (BCWA) Stream Mitigation Bank Site (Bank Site) will preserve a network of high-quality, ecologically significant streams and rare natural communities in the Box Creek Wilderness and surrounding natural areas in Rutherford and McDowell Counties in North Carolina. The Bank Site will be established under the BCWA Umbrella Mitigation Bank to provide mitigation to compensate for impacts to Waters of the United States and/or State Waters within Hydrologic Unit 03050105 of the Broad River Basin. The primary component of the BCWA Mitigation Plan is the preservation of 237,417 linear feet (45 miles) of pristine cool water streams and riparian buffers in the headwaters of the Broad River Basin. Approximately 2,740 acres will be protected under a permanent conservation easement as part of the Bank. Buffer widths on the streams range from 200 feet to 500 feet, at least six times the minimum mandatory buffer width for mitigation. Based on the proposed mitigation effort, the bank site will result in up to 47,483 cool stream credits. The diversity and rarity of species and natural communities found in the BCWA make it one of the most ecologically significant and unique natural areas in the state. Based on the number of rare species and natural communities documented on the property, a portion of the property (the Box Creek Wilderness Natural Area) ranks in the top 1% of all Natural Areas in the state (on par with flagship natural areas like Roan Mountain and Grandfather Mountain). The North Carolina Natural Heritage Program (NCNHP) designates the Box Creek Wilderness Natural Area as “Exceptional.” This is the highest ranking given by NCNHP, and reflects the number and rarity of imperiled species and natural communities as well as for the high quality of the natural communities. 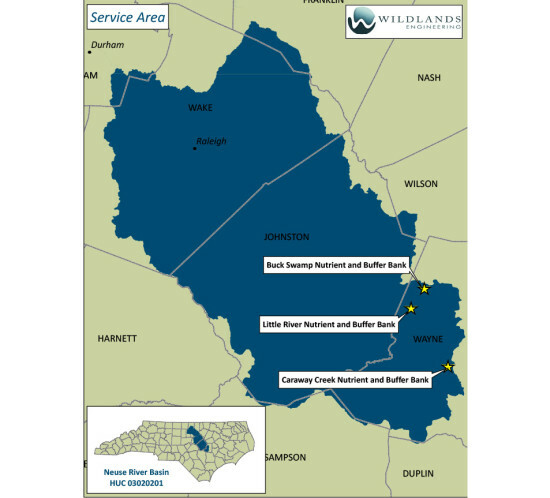 Wildlands has three riparian buffer and nutrient mitigation bank sites within the Neuse River Basin: Buck Swamp (active bank with credits available), Caraway Creek (active bank with credits available), and Little River (closed bank with all credits sold). The mitigation banks provide riparian buffer and nutrient offset mitigation credits to compensate for buffer impacts according to 15A NCAC 02B .0295 and development requiring nutrient offset payments according to 15A NCAC 02b .0240 within the Hydrologic Unit Code 03020201 (with the exception of the Falls Lake drainage area). These credits are produced through converting the land use from active row crop agriculture to a riparian forest. The projects combined will deliver both riparian buffer credits (1,203,392 square feet) and nutrient offset credits (191,104 pounds of Nitrogen). Key elements of the projects consist of developing the umbrella banking instruments, individual Bank Parcel Development Plans for each site, construction, as-built surveys, and annual monitoring. Little River was planted in 2010. Buck Swamp was planted in 2014. Caraway Creek is scheduled to be planted in 2015. 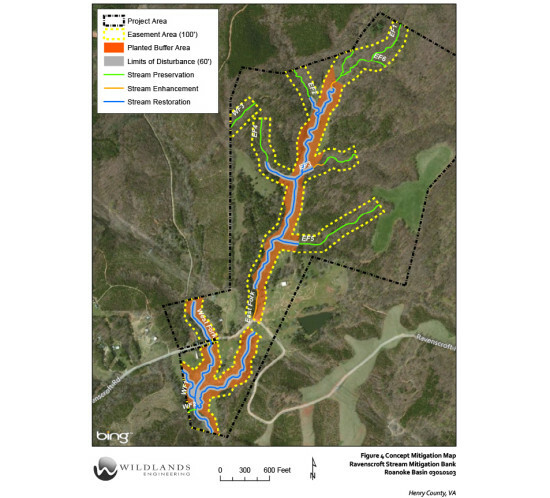 This proposed mitigation site is located in Henry County, near Martinsville, VA. The lower stream valleys along the East and West Forks of Leatherwood Creek is currently used for cattle and horse grazing. The combination of land conversion, historic channelization, livestock access, and watershed land use practices have contributed to the current impaired and degraded condition of the streams running through the lower valley. The Ravenscroft property is one of the only agricultural parcels located along Turkeycock Mountain, and as such presents an excellent opportunity to improve water quality and wildlife connectivity. The Ravenscroft site provides the opportunity to preserve 4,941 linear feet (LF), enhance 662 LF, and restore of 8,347 LF of perennial streams. Total credits that can be achieved at the site are 15,559 stream mitigation units (SMU), consisting of 681 SMU’s (4.4% of total credits) generated from preservation and 14,878 SMU’s (95.6% of total credits) generated from restoration and enhancement. 80 acres of riparian land will be preserved in perpetuity.